Today we are incredibly excited to announce the beta preview of our Search API! 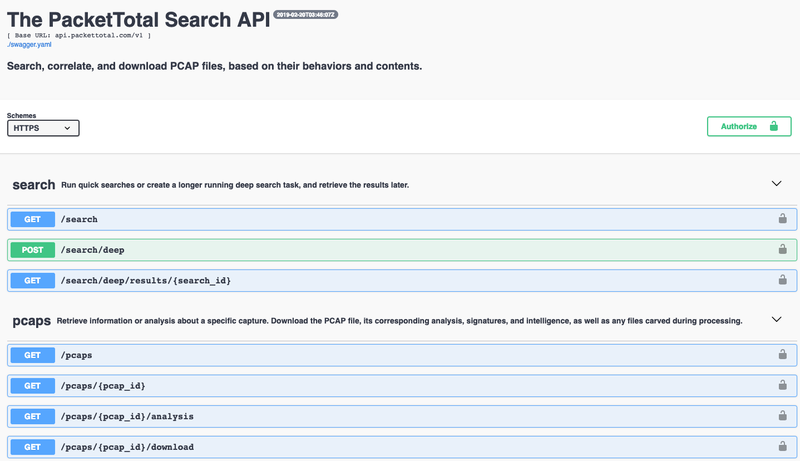 With it you can search, correlate, and download PCAP files, based on their behaviors and contents. Understand how tactics, threats, and procedures (TTPs) of malicious adversaries evolve over time. Network traffic is among some of the richest forms of evidence available to security professionals, it is also one of the hardest to analyze at scale. PacketTotal, has analyzed thousands of malicious packet captures, and derived millions of signatures, relationships, and correlations between them. 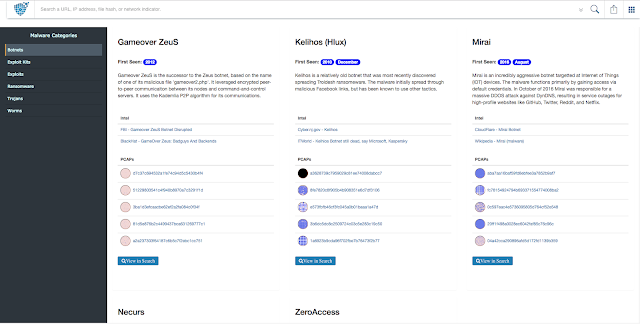 The Search API provides a powerful interface for finding network traffic that can help you understand, and anticipate the actions of malware in your own environment. Simple search for an indicator of compromise and pull back matching captures, use AND and OR aggregators to get as granular as you want with your queries. Identifying top threats and their targeted sectors. Understanding the goals of malicious adversaries is the first step in proactive security. From malware detonated in a lab to evil found in the wild, PacketTotal is the most diverse set of malicious packet captures on the Internet. Search by the latest malware campaigns, and see how it communicates, who they're targeting, and what methods they employ. Build or validate your network signatures through heuristic based approach. 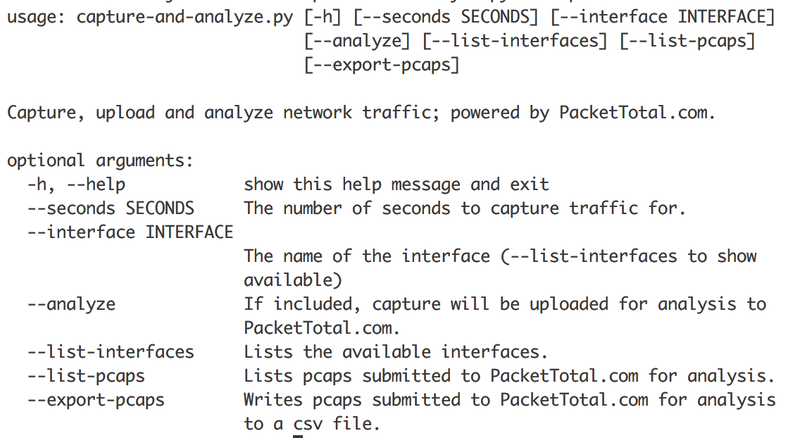 PacketTotal does a good job of providing high-level categorizations of traffic found within packet captures. Through the API you can download captures that you could use to validate controls within your own environment. Train your Machine Learning models! 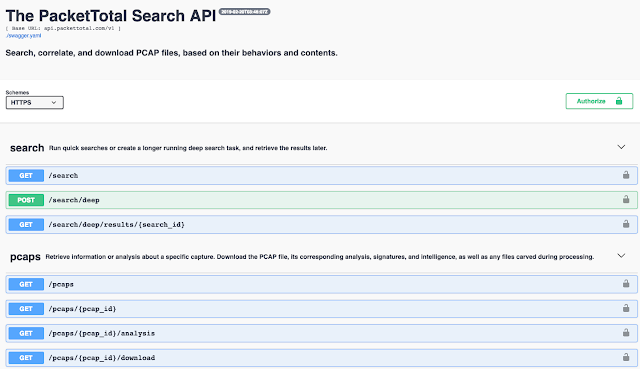 If you're a data-scientist, and are lucky enough to be studying malicious network behaviors, you may find the bulk search and download functionality of the search api to be very useful in training your models. Interested in being a part of the Beta? Ultimately, the search api is the first step in a much more comprehensive API that will offer full feature parity with the site (and more). If anything about this post excites you please consider giving our API a spin! Faster Infrastructure & Beta API - Coming Soon! Your data model can make or break your application, but it is secondary to your infrastructure. In theory your infrastructure would dictate your initial design decisions and influence your data model. However, as a developer you often find yourself tweaking both, in parallel. This often leads to bizarre and terrible design patterns. PacketTotal 1.0 ran on a two node ElasticSearch cluster, with a local based retention backend for raw pcaps. This was the case with the original version of PacketTotal, and it has lead to some scalability issues. Since the initial release we have addressed several of these by adding redundancy, load-balancing, and caching, but it doesn't solve the underlying issue - that our infrastructure was designed for a few concurrent users, not dozens. PacketTotal 2.0 ran on a much more robust ElasticSearch cluster, and migrated much of it's raw PCAP processing and retention to AWS serverless infrastructure. Understanding how tactics, threats, and procedures (TTPs) of malicious adversaries evolve over time. Dynamically detecting IOCs through heuristic based approach. Dynamically creating new signatures based around "known bad" and "likely bad"
To accomplish this we have begun the process of firstly migrating our existing data to a higher availability ElasticSearch cluster and removing some previous bottlenecks on our network. Secondly, we've re-indexed our data, and mapped it to field specific data-types. This dramatically increases search performance and accuracy as well as our ability to correlate across datasets, allowing us to start delivering on some of the use-cases above. The new infrastructure is still undergoing testing, and will not be put into production until mid-march. In the meantime, stay tuned for the beta API release later this month which we will be making available to those interested! As PacketTotal's database grows so do the challenges around categorizing that data. The main goals of 2018 were to improve the intelligence coming out of the tool and provide methods of increasing usage of the tool through improved search and community tagging. This meant providing the ability for users to tag packet captures, and re-designing the search-engine from scratch. All of this work has positioned us well to start building out consulted intelligence views allowing us to group traffic, and understand malware trends over time. Our first major release this year is the malware archive. The malware archive is the result of research done by the PacketTotal team and intelligence provided by the community. It is the first view that looks at data on PacketTotal at a holistic level, and we plan to create similar views to map out long term trends, and high-level metrics. Initially, the malware view will be fairly bare-bones, containing some popular malware variants from notable categories. This list will be updated daily, and we always welcome community feedback if a listed entry is invalid. Many exciting updates to come! 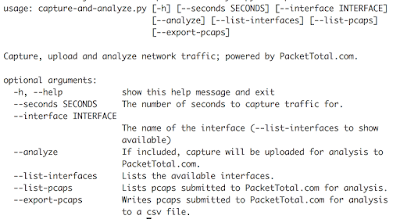 We've recently released an open-source toolset that, among other things, allows you to analyze PCAPs in bulk on PacketTotal.com. The toolset can be easily inserted into your network analysis workflow and can be used to capture network traffic for an arbitrary time, or upload multiple packet captures at once for analysis. SnappyCap also tracks the status of each analysis submission, and will quickly return whether any malicious signatures fired. In order to begin using this tool you must first fill out this form to be granted the ability to write to our public S3 repository. 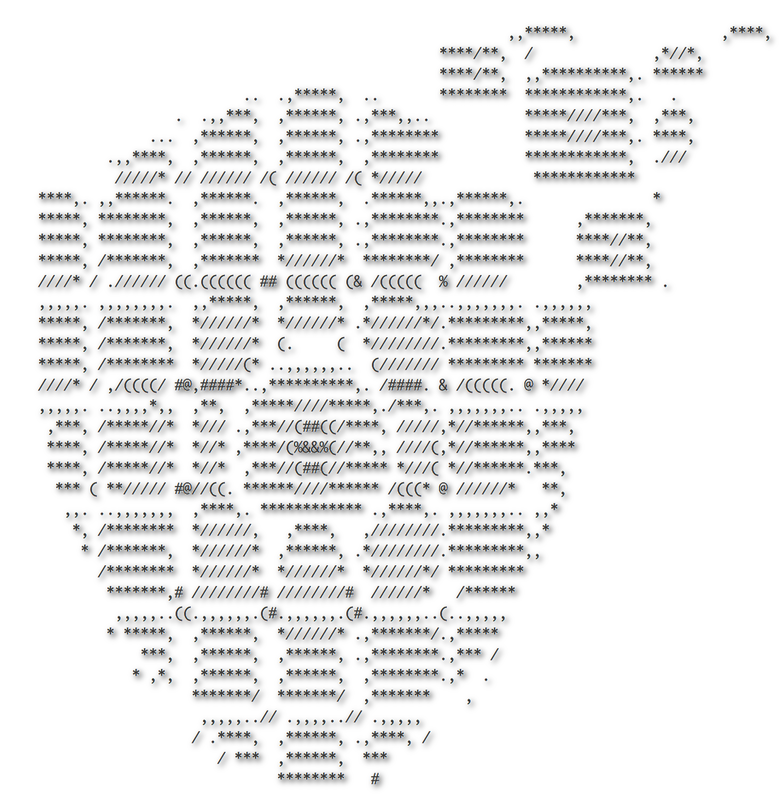 Captures Glyphs are a super high level representation of the traffic inside a PCAP. At a glance, you can determine roughly how many sessions occurred within the capture, how many of those sessions were TCP, UDP, or ICMP, and the rough duration. 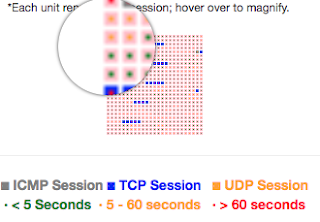 Each unit, or square inside a Capture Glyph represents a TCP, UDP, or ICMP session. 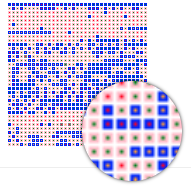 The pixel in the middle of each square represent the duration of that session. 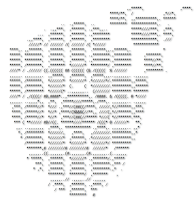 This glyph for example represents a PCAP that contains about 50% TCP traffic 50% UDP traffic. If we zoom in we can clearly see sessions that lasted over 60 seconds, and some that were very short as well. PacketTotal now contains almost 35,000 packet captures, over 70,000,000 records, and 20,000,000,000 data-points, this has lead to some challenges around searching and sorting the data. Over the past few months search has gotten several improvements. We modified our algorithm to pre-process queries, and optimize them prior to search. We've doubled the number of nodes on our ElasticSearch backend, and added backend load-balancing. However, even with all these improvements making large queries, those with hundreds or even thousands of strings, poses technical issues with the current infrastructure. Obviously, being able to search our dataset quickly is a huge priority, and to get around the technical barriers we created a separate query infrastructure on AWS. This query infrastructure provides the ability to run distributed searches asynchronously, which translates to lots of queries very fast. To test this infrastructure we have created a tool called Bulk IOC Search Utility, which can take in a list of up to 100 line separated IPs, URLs, domains, hashes, etc. We are also planning additional projects that will leverage this infrastructure. These will be tracked here.